Fragmentation: The story of the customer journey in a multimedia world. With customers now taking thousands of different media routes this webinar is about helping you to find the most relevant prospects with the highest likelihood of converting them to customers. Once upon a time, you could reach Business Bob by advertising in his morning paper, the posters at the train station on his way to work and in the centre break of News at Ten. Business Bob now makes his decisions by researching on the internet, he seeks peer reviews via blogs and forums. Hit him with an email, or with an offer via social media that is on topic and timely whilst he is in research/education mode and your conversion rates will soar. • Measure the effectiveness of each media element. 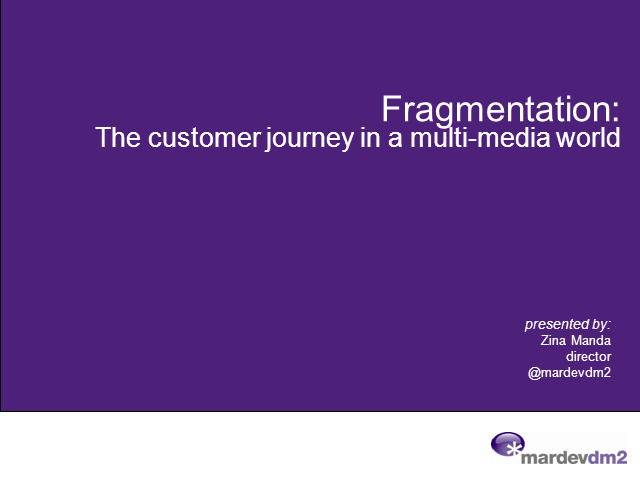 Title: Fragmentation: The story of the customer journey in a multimedia world.